You can enjoy Lake Cadillac and Mitchell in more ways than one while sitting lakeside at one of our many lakeside restaurants. Get hooked on the abundant fish dishes. Cadillac Grill Salmon Eldorado: A Bronze North Atlantic salmon inspired by the Cherry Capital (Traverse City), finished with an in-house made red onion cherry marmalade. Passage North Sautéed Lake Perch: lightly floured, pan fried, with lemon butter. Hermann’s European Café Sautéed Ruby Trout: made with a white wine, an herb butter featuring parsley, cilantro and thyme, with chopped capers and sweet shrimp on top. 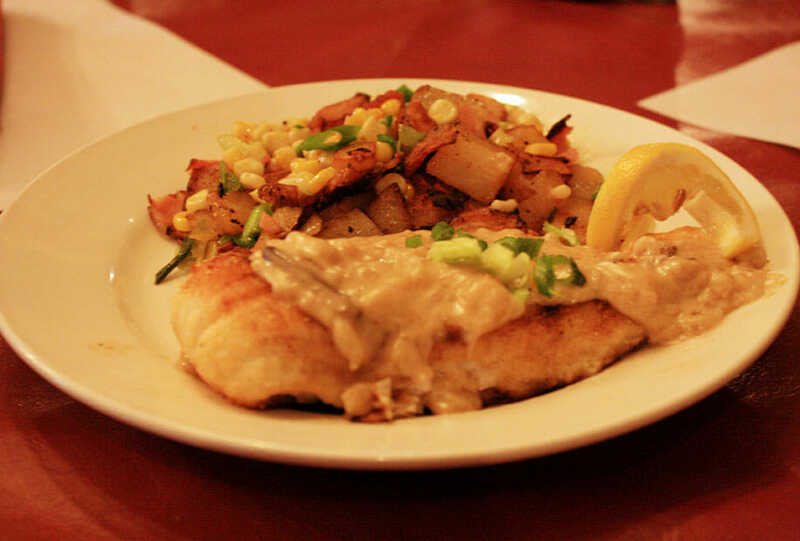 Lakeside Charlie’s Sautéed Walleye: Fillet of fresh Walleye sautéed until golden brown. Topped with wild mushroom ragout. Served with a hash made of sweet corn, prosciutto ham and potato. Coyote Crossing Sautéed Salmon: Served on a bed of rice or with a baked potato, request Cajun if you like it spicy. Burke’s Waterfront Restaurant Maple Glazed Salmon: An Alaskan fillet glazed with a special blend of maple seasoning.